Director Emeritus Martin Heimann and group leader Julia Marshall of the MPI-BGC travelled to India this week, to attend the Kick-Off Workshop of our Max Planck Partner Group at the Indian Institute of Science Education and Research in Bhopal (IISER-B). The partner group is headed by Dhanya Pillai, former MPI-BGC scientist in the Systems Department. The workshop provided the opportunity to bring together international key note speakers and the national community of researchers working in the field of greenhouse gas measurement and modelling, with the goal of developing an integrated greenhouse gas monitoring system in India. 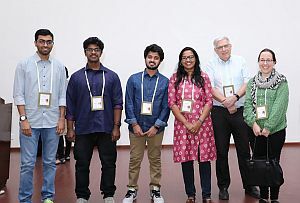 This goal is substantially supported by the award of the Max Planck Partner Group to Dhanya Pillai, which will help her to build up a new group while maintaining tight collaborations with her former colleagues in Jena.